The Motorola Moto M is a mid-range handset that is powered by a MediaTek Helio P15 chipset. That means it features an octa-core CPU, which in this case is clocked at 2.2GHz. Did we just hear you ask about the graphics processor on the unit? That would be the Mali-T860 MP2. This would also be the perfect time to tell some of you that a mid-range phone doesn't necessarily carry a small screen. The Moto M comes with a 5.5-inch LCD display carrying a 1080 x 1920 resolution. As we've pointed out before, under real life conditions you cannot tell a screen with that resolution apart from the 1440 x 2560 resolution on a display carried by a high-end phone. As it turns out, the Moto M has just started to receive an update that takes the device from Android 6.0 to Android 7.0. That's Nougat, everyone. 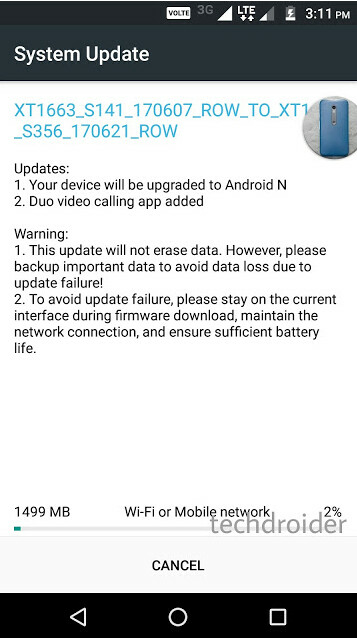 And to ensure that you receive the update with your phone intact and not bricked, you need to follow some standard rules. Once the update arrives on your phone, make sure that it is connected to a Wi-Fi network, or a strong cellular signal. At the same time, check the battery on your phone. You want it to be fully charged. Having your handset shut off in the middle of a software update is inviting disaster. Android 7.0 comes with features such as the ability to respond to messages from inside the notification. You can also find some extra battery life here and there thanks to the improved Doze, which closes the apps running in the background when the phone has been inactive for some time. Wonder why you don't use as much battery life overnight if you keep your phone on? Doze is why. With multi-window, you can run two apps on the screen simultaneously. And Unicode 9 gives you enough relevant and fresh emoji to use with your messages. The update not only allows the Moto M to run on Android 7.0, it also adds Google's video chatting app Duo to the handset.